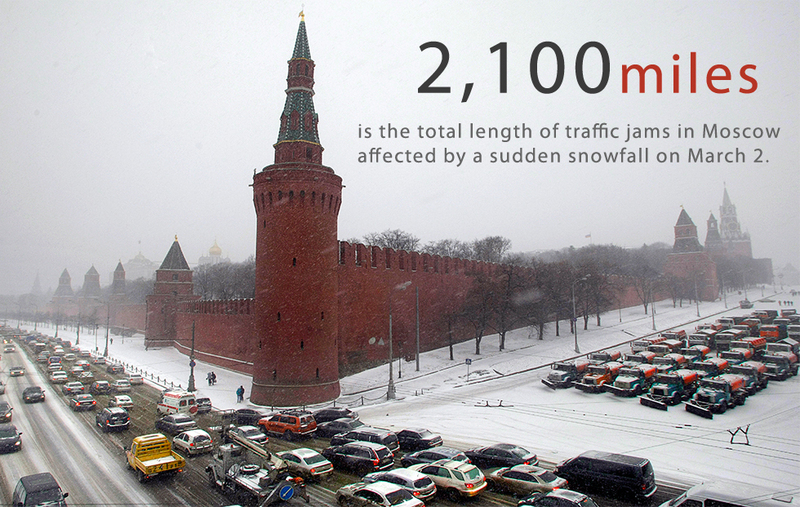 The total length of traffic jams in Moscow caused by an abnormal snowfall has exceeded the distance between Moscow and Rome — 3,400 kilometers, according to the press service of the traffic situation monitor operated by internet giant Yandex. "The total length of traffic jams has reached 3,400 kilometers, which is even more than the distance between Moscow and Rome. The reason for this was a heavy snowfall that continued all night," the press service said. The longest traffic jam was 17 miles (27 km) in length. The weather in Moscow broke the 50-year-old precipitation record for this particular day. On March 2 Moscow saw up to 24 mm of snow, which is slightly more than 70 percent from the amount the city sees during one month (34 mm).